Hospitality workers and taxi drivers have a heavy burden to carry. Not only are they professions where long hours equate with low pay, they also become the default cultural ambassadors of any country. The intersection between taxi drivers, generally working class folk (though I’ve met drivers who are struggling grad students) and generally privileged travellers is a fascinating study in itself (some might contest ‘privileged’ but even if you’re a poor traveller, by virtue of being able to choose to be away from your western home country you are privileged imo). Generally taxi drivers here have been pretty friendly and helpful, with my mishmash of Arabic we can figure out where to go. Things are bit more, shall we say, laissez faire here. Be prepared for lots of chain smoking (Mad Men prevalent here), talkback morning radio and the driver stopping for a roadside coffee pick up or even to say hi to a friend. The smoking carries on in cafes, restaurants and in most public spaces (which makes the incessant warnings not to smoke on the plane on my way to Amman finally make sense). 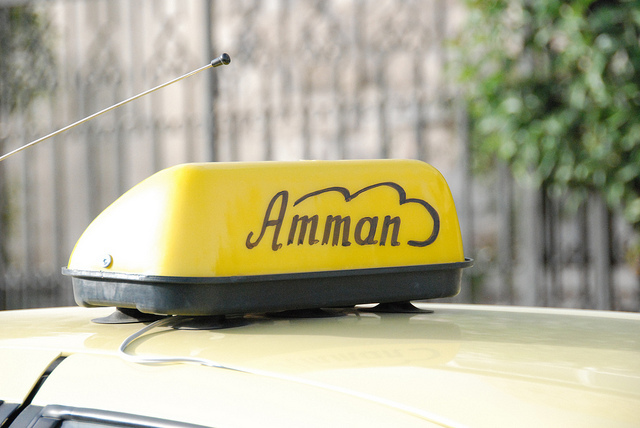 Catching taxis in Amman is a precarious business. Picture: Paul Keller, Flickr. The fastest way to get around is a taxi which is relatively affordable, safe and in plentiful supply (at least in non peak hour times). Knowing enough Arabic phrases to get around is a must. Street addresses won’t cut it here, so best to know a landmark around where you’re going. Drivers are nothing if not resourceful and will stop locals or even call a friend to find a tricky destination with limited information. Catching a taxi is a great way to practice street Arabic, understand local culture and get the best tips on restaurants (though there is no obligation to make conversation if you’re a female, or if you are uncomfortable with any personal questions). I’ve heard grumblings about economy and cost of living, and gained insights into social interactions. Dealing with drivers is also the best way to do to your head in trying to control what I will delicately call the ‘the meter situation’. The battle of the meter begins when you step in. You need to make sure it is set to 25 qirsh or a quarter of a dinar. A trip anywhere in Amman should cost no more than three to four JD. Every traveller and even locals have taxi war stories to tell. Some drivers won’t turn on the meter and will want to negotiate a price and then maybe ramp it up later. Some travellers ruefully admit to being charged up to 10 and even 20 JD. After 11pm the fare will generally double and the meter will start from a higher base. Yellow taxis are your best bet. You can venture into the shared white taxis which are cheaper (you shouldn’t pay more than a dinar) but prepared to share with other passengers. Now if I were poor taxi driver I would try to extort as much as I can too. But being on the other side of the driver’s seat (and if you’re a woman it’s culturally most appropriate to ride in the back) I’m here to provide practical tips to avoid being ripped off. Besides refusing to ride into a non-metered taxi, there are some beautiful Arabic phrases to deal with tricky taxi or market negotiations. My favourite idiom “fi mish mish” (which means something like “in the apricot/s”) translates delightfully to convey the ridiculousness of a proposition; an Arabic “when pigs fly” if you will. This is all part of the drama of bargaining in countries where respect derives from your ability to Apricot the situation. The way you negotiate living in a city is I feel almost a microcosm of a society’s values. In western countries most commercial transactions are passive, fixed, cold. In others, everything is a negotiation, a dance, a play between two people where one’s knowledge and wits can be tested. This can be stressful when you’re used to the latter way of doing things, but once you understand how it works it can be enjoyable. Fi mish mish- I love it! When I learn a beautiful sounding Arabic word I randomly repeat it so many times, my fellow students accuse me of suffering Aspergers.